I was introduced to Victor Fung through a mutual friend who I met on Clore Emerging Leaders 2017 (read about this programme here). Victor’s practice is international, and he was looking for a Producer to support the development of his work in the UK. From the Top by Victor Fung. Photo by Keith Hiro. Victor Fung is an award-winning choreographer based in London and Hong Kong. He is the Artistic Director of Victor Fung Dance and is currently a Clore Fellow under the mentorship of Wayne McGregor. Victor received his early training from Hong Kong Academy for Performing Arts and University of California Santa Barbara. He later completed an MA in Choreography at London Contemporary Dance School and is currently conducting doctoral research with a studentship award from Middlesex University and Dance4. Victor was the recipient of the Award for Young Artist at the 2013 Hong Kong Arts Development Award in recognition for his international artistic achievement in dance. He is also an Associate Artist of Swindon Dance (2017-) and a Studio Wayne McGregor FreeSpace Artist (2018-). As a choreographer, he has received funding and commissions internationally including Arts Council England, Chisenhale Dance Space (UK), Hong Kong Arts Festival, Hong Kong Arts Development Council, Hong Kong Dance Alliance, City Contemporary Dance Company (HK), Hong Kong Academy for Performing Arts and Junior Dance Company (IT) amongst others. His production Not Enough (Beyond Reason) was shortlisted as one of the three Outstanding Independent Dance for the 2012 Hong Kong Dance Award. From The Top (Final Edit) in rehearsal. Inspired by Victor Fung’s early work From the Top choreographed in 2015, From The Top (Final Edit) is an absorbing dance-theatre piece that critically reflects how dance is made. 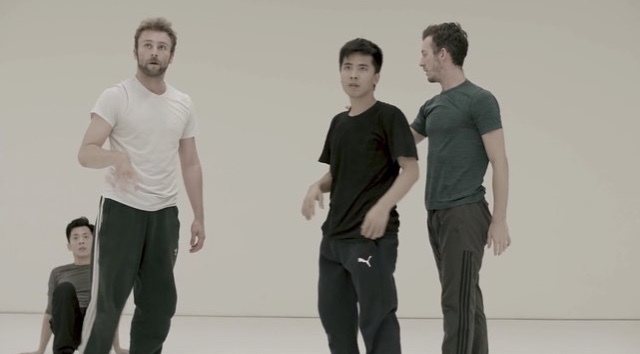 An original cast of dancers (Kenny Leung and Ronny Wong) is tasked with teaching two new dance artists (Jack Sergison and Michael Barnes) a piece of choreography that was made for very different bodies. As the dancers get to grips with the choreography and with each other, they are guided by an invisible but highly audible choreographer – whose extensive demands become more and more eccentric. The result is a subversive and often hilarious theatrical experience, where artistic expectations and human capabilities clash. From the Top (Final Edit) is a witty dance work that explores the power relations between performers and dance-makers. The piece presents to the audience a fictional scenario based on the everyday life of dance artists and looks at the absurd nature of artistic integrity, dancer irreplaceability, and what it means to make “art”. The action on stage is juxtaposed with voiceovers and subtitles to reveal the politics between the ever-demanding choreographer and the dancers, who continuously attempt to fulfil their director’s artistic vision. Just how much can choreographers get away with, in the name of art? Victor Fung is an Associate Artist of Swindon Dance and is supported by Studio Wayne McGregor FreeSpace Programme. From The Top was originally commissioned and produced by Hong Kong Arts Festival and premiered at The Hong Kong Jockey Club Contemporary Dance Series 2015. The R&D took place in September of this year, with the hopes of further rehearsal and tour dates in Autumn 2019 and beyond. “The most exhilarating… was Victor Fung’s From the Top… incarnates the ever-present tension between dance-maker and dancers… Kenny Leung and Ronny Wong [are] both very talented and very funny.” Carla Escoda, Huffington Post. I love working internationally, although there’s a lot of responsibility in coordinating projects across cultures! I’m glad to be working with Victor to bring this project to life, and I’m looking forward to taking this to venues in the UK and abroad. Watch this space!